Oh my goodness! Aren’t you just SO excited that Halloween is just around the corner? In my family, we LOVE Halloween. My kids love getting FREE candy (of course!) but our favorite thing is to DRESS up! 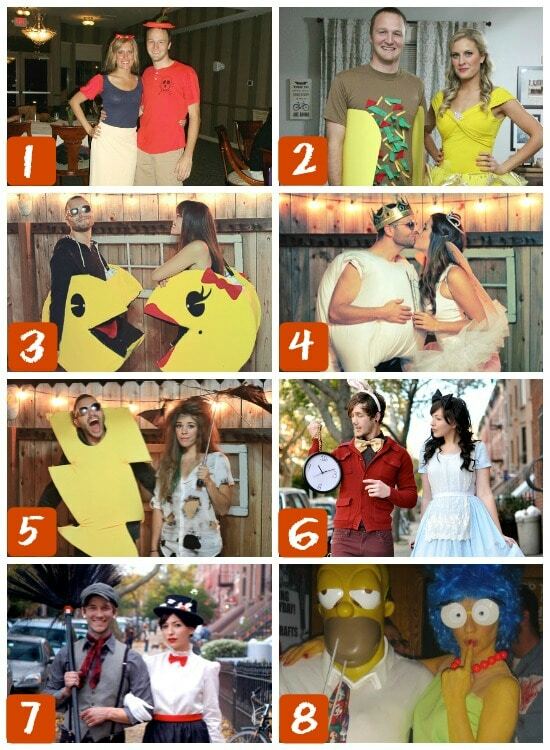 Over 100 Creative Halloween Costumes! Just wait til you see allllll the fantastic costumes to help pick the best costume for you and/or your family! 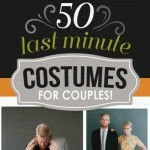 If you are like me and love to dress up with your spouse, but sometimes have a hard time finding the perfect costumes, then this list is for YOU! 1- Snow White and a Poison Apple by Katierainesblog.com: I love that this costume idea is a spin-off of the normal Snow White and a Prince and instead does Snow White and a Poison Apple – who wouldn’t thought?! 2- Taco Belle by Katierainesblog.com: Taco Bell isn’t just a great restaurant, now it’s a fantastically creative Halloween costume! 3- Mr. and Mrs. Pacman by Julie Ann Art: I grew up playing Pacman as a kid – and now I can actually BE Mrs. Pacman and my hubby Mr. Pacman. What makes this the best is that I can MAKE this creative Halloween costume! Yay! 4- Tooth and Fairy by Julie Ann Art: Um, seriously?!!! This is just too cute…instead of being a Tooth Fairy – you can be a pretty fairy while your spouse is the tooth! So creative! 5- Struck by Lightning by Julie Ann Art: I absolutely love this creative Halloween costume. I think the ‘burnt’ hair and clothes really MAKE this costume. 6- Alice and the White Rabbit by Keiko Lynn: There are tons of Alice in Wonderland costumes out there, but if your spouse allows you to turn him into an adorable white rabbit, then this one takes the cake! 7- Mary Poppins and Bert by Keiko Lynn: Mary Poppins is a classic – go a little ‘retro’ with this awesome costume idea for you and your spouse. 8- Homer and Marge Simpson by Costume Works: Wow, if these costumes don’t win most creative at a party – I don’t know what would! I just love the look on Homer’s face! Classic! 9- Doritos by Brit & Co: I have to admit that I have NEVER thought of dressing up as a famous snack. Doritos are to die for, so why not dress up like them. Yummy! 10- Popeye and Olive by Brit & Co: Popeye and Olive have been around for years, but maybe not looking THIS cute! 11- John Lennon and Yoko Ono by Brit & Co: Why not try these ‘rockers’ on for size?!!!! John Lennon and Yoko Ono are a guaranteed show stopper with these Halloween costumes. 12- Bettlejuice Couple by Brit & Co: Beetlejuice, Beetlejuice, Beetlejuice…this is probably the most quoted line from the movie, but I don’t think this monster couple from the movie is anywhere close to what you need! 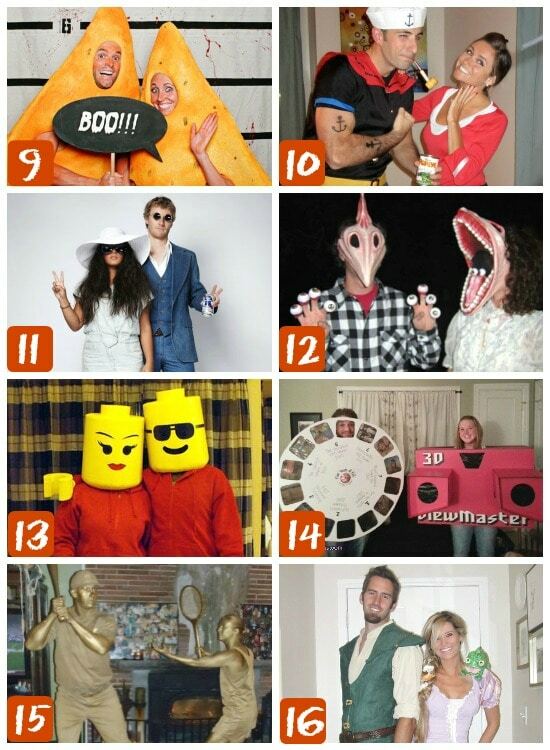 13- Legos by Brit & Co: Who would have thought that life-sized Legos would make such an amazingly creative Halloween costume?! 14- 3D Viewmaster and Sidereel by Costume Works: Kids these days wouldn’t even know HOW to use one of these fun machines. Try this fun costume to be the hit of Halloween! 15- Trophies by Costume Works: Who knew that your old trophies would be inspiration to some amazing Halloween costumes! 16- Rapunzel and Flynn Rider by Costume Works: I love the new Disney movie – Tangled – and these Halloween costumes are just as great! 17- Bob Ross and Mona Lisa by Costume Works: Bob Ross was awesome to watch on tv. 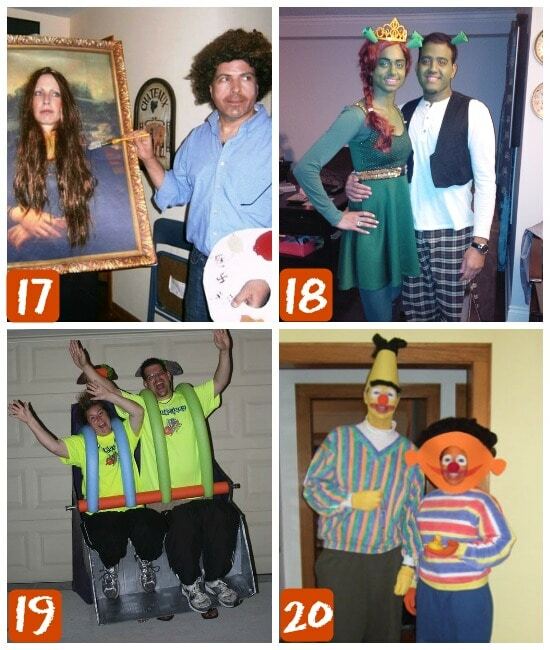 Why not let his name live on by dressing up in this creative couple’s costume?! 18- Shrek and Fiona by Costume Works: Shrek and Fiona are becoming classic Halloween couple’s costumes, but just look at them – why wouldn’t they be adored? 19- Roller Coaster Ride by Costume Works: Oh my goodness!!! When I first found this costume I literally LAUGHED-OUT-LOUD! It is just awesome! This gives a new meaning to the saying “stuck like glue” :-D! 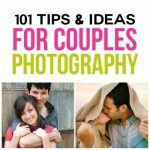 20- Bert and Ernie by Cosmopolitan: Bert and Ernie might not be your idea of a ‘normal’ Halloween couple’s costume, but who said anything about wanting to be ‘normal’?! I think that maternity costumes can sometimes be the most fun, but I guess it depends on who you are asking! 21- Sun, Constellation, and Galileo by Really Awesome Costumes: Oh my goodness, this costume is to die for, especially since the hubby joins in. Kuddos to him! 22- Magic 8 Ball by Really Awesome Costumes: Growing up, Magic 8 balls were the best! Why not just turn your baby belly into one? Genius. 23- Bump in the Road by Really Awesome Costumes: Create your baby bump into this construction hazard. Too cute! 24- Humpty Dumpty by Really Awesome Costumes: Humpty Dumpty is no longer a great nursery rhyme, it is now one of the most creative DIY Halloween costumes! 25- Farmer and Cow by Really Awesome Costumes: Oh, this Halloween costume is just to die for! What a creative way to show off your baby bump. 26- Skeleton by Really Awesome Costumes: This fun skeleton costume really makes you take a second look to make sure you really see the baby skeleton in there! 27- Momma Bird in a Nest by Costume Works: Oh my goodness…this seriously has to be one of the most creative maternity costume I have ever seen. This is just AWESOME! 28- Cat Eats Fishy by Coolest Homemade Costumes: This costume has a bit of a humor and a lot of creativity! 29- Mike Wazowski by Coolest Homemade Costumes: I really like the whole story of Monsters, Inc. and this costume really uses Mike Wazowski’s one eye to the fullest! 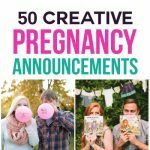 30- Pregnant Basketball Player by Coolest Homemade Costumes: You gotta give a little attitude with this costume – since you are literally carrying the ‘ball’! 31- Day of the Dead by Coolest Homemade Costumes: If you are talented with make-up then this is the costume for you! Transform your little one into a character so he/she can really come to life! 32- Pregnant Zombie by Coolest Homemade Costumes: This costume will really creep people out as they try to figure out what is crawling out of your belly! 33- Danger, Curves Ahead by Coolest Homemade Costumes: Transform yourself into a road sign that will make everyone smile because of it’s awesome creativity! 34- Pot o’ Gold by Huffington Post via Coolest Homemade Costumes: Your belly is on the ‘other side of the rainbow’ or wait…is that a pot o’gold?! I LOVE dressing my babies up for Halloween. 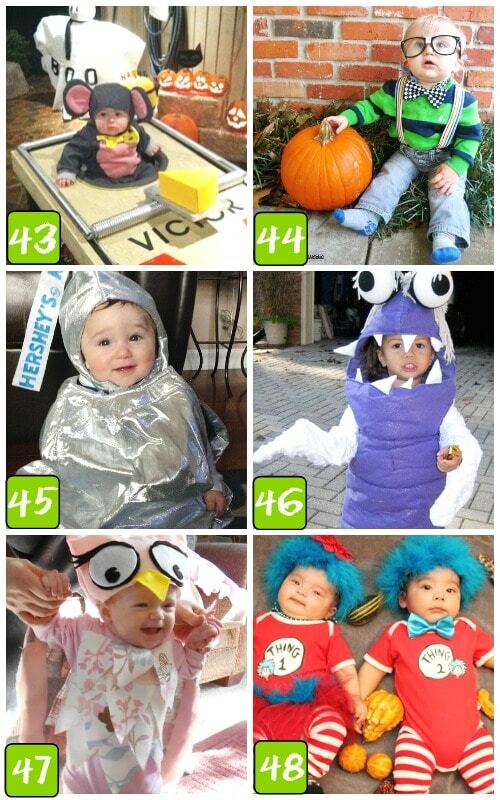 Here are the top 21 cutest and most creative Halloween costumes for babies. 35- Cabbage Patch Doll by Costume Works: I grew up playing with cabbage patch dolls, so to turn my baby into one would bring back lots of memories! 36- Baby Duck by Costume Works: This Halloween costume just makes me want to squeeze this cute baby! Adorable! 37- Baby Grandma by Costume Works: Wow, what a creative and fun costume – turning your baby into a grandma. Hilarious! 38- Mr. Peanut by Costume Works:This little baby is just too squeezable in this Mr. Peanut costume. 39- Momma’s Prisoner by Costume Works: This is a fun way to turn your little loved one into an ‘inmate’. Lol! 40- Raggedy Ann by Costume Works: Raggedy Ann is such a cute way to dress up your precious girl. 41- Stay Puft Marshmallow by Costume Works: As if baby rolls weren’t scrumptious enough…now you add in a puffy marshmallow Halloween costume and your baby will be irresistible. 42- Syndrome by Costume Work by Costume Works: Spike up your hair to transform your baby into an adorable villian! 43- Mouse Trap by Costume Works: Wowzers…what a creative and fun Halloween costume this makes! 44- Baby Nerd by Costume Works: This costume is just precious and could fit any baby! 45- Hershey Kiss by Costume Works: Wrap your sweet little one into this delicious Halloween costume. 46- Boo from Monsters Inc. by Costume Works: As if your little one wasn’t cute enough – add this cosutme and they were be out of this world! 47- Little Owl by Costume Works: Your baby will be a ‘hoot’ in this cute costume. 48- Thing 1 & Thing 2 by Costume Works: Oh these creative costumes are perfect for twins or siblings. 49- Super Mario by Costume Works: Your little one will be a true hero in this costume. 50- Jimi Hendrix by Costume Works: If your little one loves music, then this rocker costume is just for him! 51- Hobbit by Costume Works: Turn your little guy into a precious character from a book and movie. 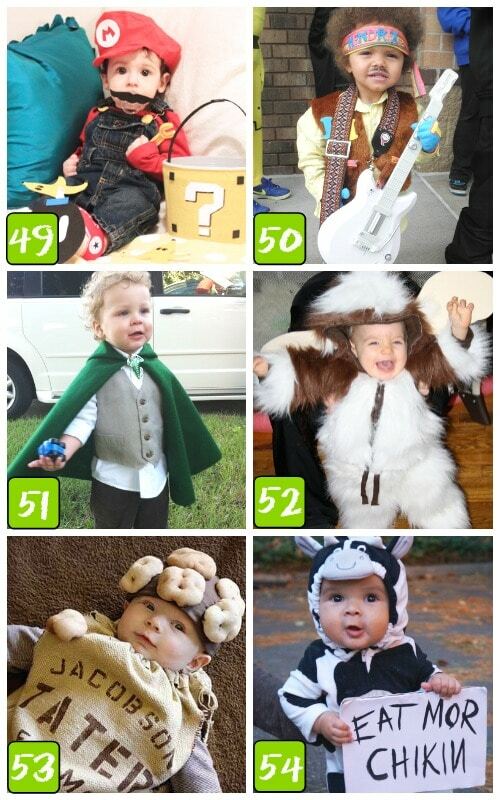 52- Gizmo by Costume Works: If your baby is a bit of a rascal then this adorable costume is just for him/her. 53- Potato Sack by Costume Works: What an awesome DIY costume idea – guaranteed to put a smile on everyone’s face. 54- Chik-fil-a Cow by Costume Works: “Moooooo”ve over chicken, because here comes an adorable cow! 55- Baby in an iPhone by How Wee Learn: This costume is perfect for babies that aren’t quite big enough to walk yet! 56- Baby Octopus by How Wee Learn: With this DIY Halloween costume, you will transform your little one into a world of cuteness. 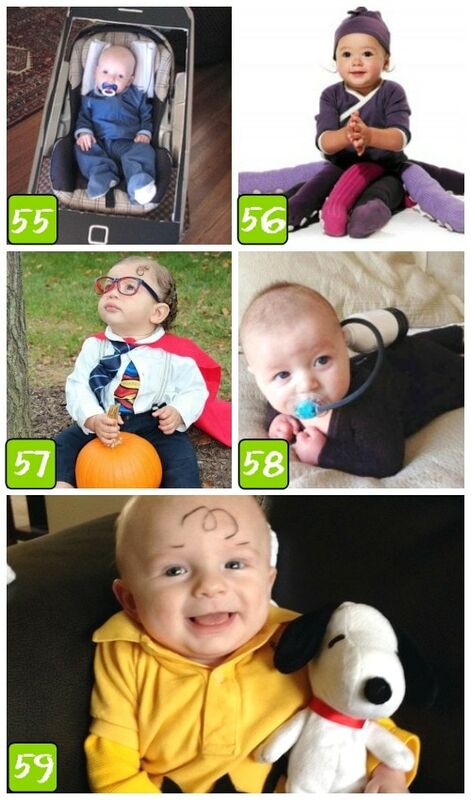 57- Baby Clark Kent by How Wee Learn: Oh my goodness…aren’t those glasses to die for. What a fabulous costume for your little guy. 58- Baby Scuba Diver by How Wee Learn: What a fun & easy DIY costume – black onesie- a little box for scuba gear, and a cute baby is what is needed for this cute costume! 59- Charlie Brown by BuzzFeed: This costume is perfect for babies that are chubby and without hair ;-). 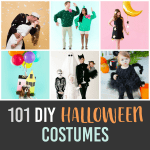 Search through these kids Halloween costumes to find a great one for any aged child. 60- Batman and Robin by Costume Works: Usually when you think of Batman and Robin you think of boys, but here is a cute girl version of each costume. They are just adorable! 61- French Fries and Ketchup by Costume Works: Mmmm, my tummy says yum, but my eyes say YES! These are adorable costumes. 62- Oscar the Grouch by Costume Works: Let your child have fun with this fun costume. 63- Mater by Costume Works: Mater is just awesome and this Mater costume doesn’t disappoint! 64- Willy Wonka by Costume Works: Put your little guy in this fantastic Willy Wonka costume and see if he can win you over with his charm. 65- Little Red Riding Hood and Wolf by Costume Works: These 2 costumes are just perfect for siblings of any ages. 66- Crazy Cat Lady by Costume Works: This is just down-right hilarious! What I love about this costume is that I can do it myself and won’t loose its charm! 67- Audrey Hepburn by Costume Works: If you have a little diva, then this costume is perfect for her. 68- Laundry Basket by Costume Works: This is another costume that is just to die over with laughter. This is definitely for the child with a sense of humor! 69- Robin Hood by Costume Works: Oh my goodness, every little boy would look amazing in this handsome Halloween costume. 70- Little Chicken by Costume Works: Dress your little one up in this fun Halloween costume and be the source of oooo’s and aaaahhhh’s. 71- Big Bad Wolf by Costume Works: This costume is just fantastic with all it’s realistic parts! 72- Carl from Up by How Wee Learn: What little boy wouldn’t want to dress up like an old man and have tons of balloons to walk around with? I know my boys would! 73- Chanel Bag by BuzzFeed: If your little girl is into fashion then this is the costume for her. 74- Cruella De Vil by BuzzFeed: I just have to give a shout out to the little girl in the picture. She is a perfect Cruella De Vil. I bet your daughter can pull it off too! 75- Alice in Wonderland: I love the part in this story when Alice grows big and this costume shows that off perfectly. 76- Mister Rogers by BuzzFeed: Oh my goodness! This is to die for! What a handsome little guy your man will be in this costume. 77- Cotton Candy by BuzzFeed: Sweet tooth? This costume will have your mouth watering all night long. 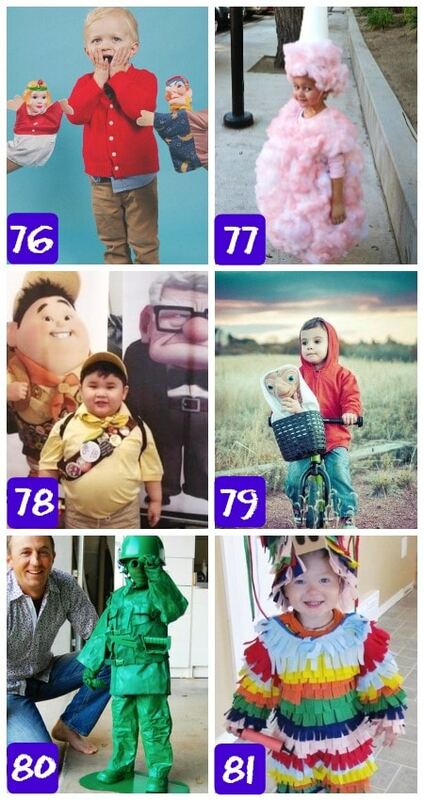 78- Russell from Up by BuzzFeed: This list wouldn’t be complete without Carl’s second-hand man Russell! 79- E.T. the Extra-Terrestrial by BuzzFeed: This costume bring back so many memories growing up. This is a great costume for any little boy. 80- Toy Soldier by BuzzFeed: Now this dad has talent! I can’t believe how realistic this costume is. Your son will be a hit if you can duplicate this! 81- A Pinata by BuzzFeed: This costume is just too cute. Just remember that is your child in there, not a box full of candy. LOL. If you are like our family, then we ALL like to get dressed up. 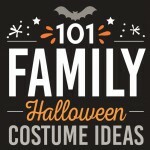 This list will get your creative juices flowing for your perfect family Halloween costumes. 82- Harry Potter and Dobby by Costume Works: This mom looks precious with her little one in this duo costume. 83- M&M Family by Costume Works: These DIY costumes are perfect for the whole family! 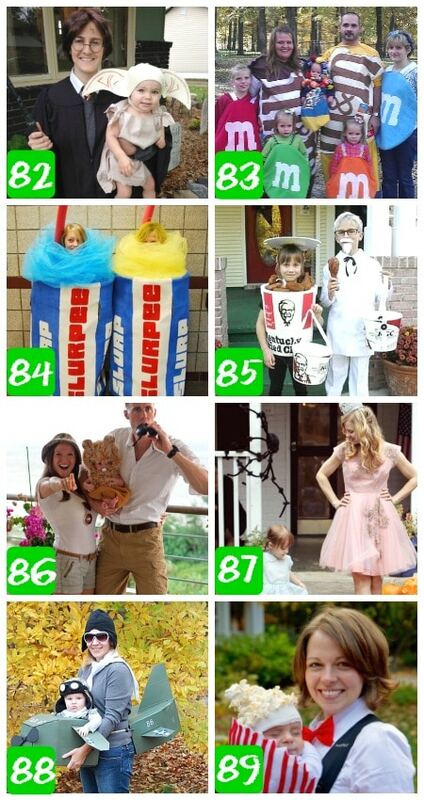 84- Slurpee by BuzzFeed: My husband and I just laughed at these super creative costumes and we really want to duplicate these for our 4 kids! Slurpee anyone? 85- Colonel Sanders and Kentucky Fried Chicken by BuzzFeed: Chicken anyone? LOL – have your kids dress up in these costumes and everyone will notice their creative Halloween costumes. 86- African Safari by Marshalls Abroad: What a fun family adventure these costumes are! 87- Wizard of Oz by Brave in Love: There isn’t a shortage of characters in this story. All your family members can play a part in your own Wizard of Oz. 88- Aviators by Babble: This creative Halloween costume is great for a mother/son duo. 89- Popcorn and Concessions by Babble: What a handsome couple these two make in their yummy costume. 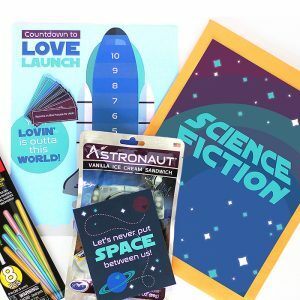 90- Rocket, Stars and Astronaut by Babble: Oh, this is just an adorable costume for the whole family. 91- Spider and Web by Babble: How fun to have a mom/baby partnered costume – you definitely can’t have one without the other. 92- Milk and Cookies by Babble: You will make everyone jealous in these delicious looking costumes! 93- Football Fans by Babble: No matter their ages, they can become football fans – and you can join them with your favorite team’s jersey too! 94- Ice Cream Cones by Babble: These costumes are one-of-a-kind. I just hope the ice cream doesn’t melt during trick or treating. Just kidding! 95- Three Blind Mice by Babble: If your kids are close in age, then this will be a perfect Halloween costume for your family! 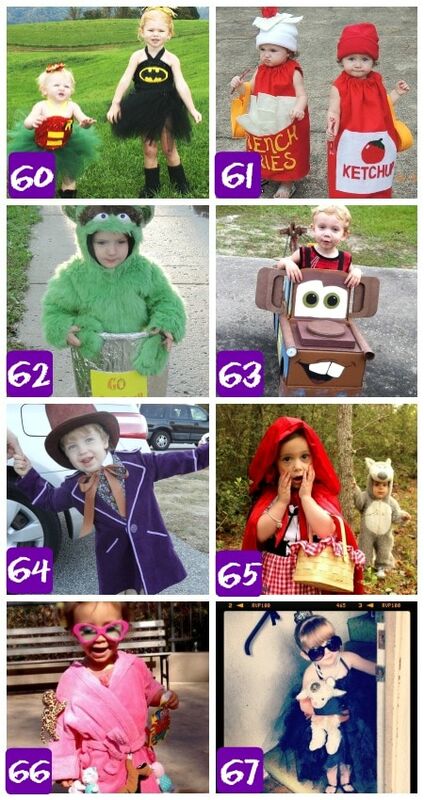 96- Toy Story by Babble: Get the whole family involved with this theme of Halloween costumes. 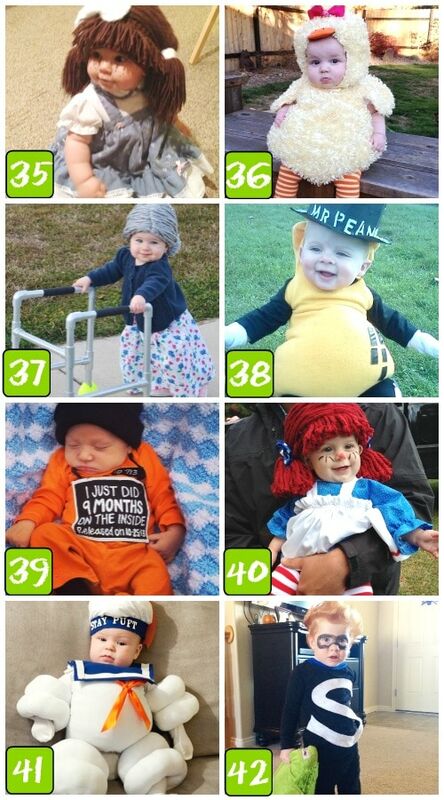 97- Up Movie Characters by Tall Mom, Tiny Baby: These costumes are super fun and super creative – a fabulous combination! 98- Superhero Family by Tall Mom, Tiny Baby: Channel your inner Superhero when your family dresses up in these characters. 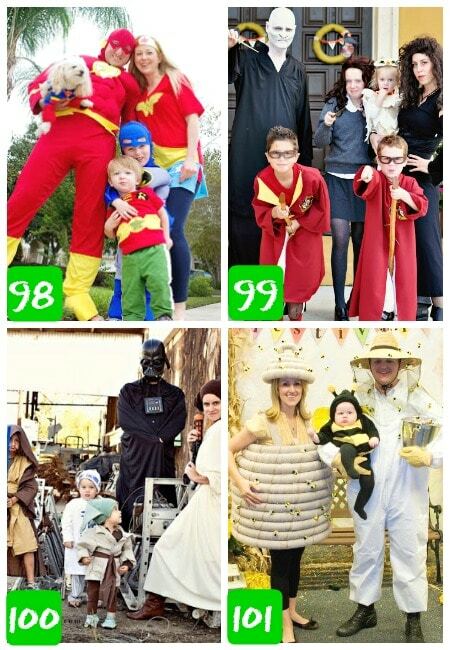 99- Harry Potter Family by Tall Mom, Tiny Baby: Harry Potter is a must to make Halloween complete! 101- Beekeeper, Beehive and Bee by JaMonkey: These creative Halloween costumes are just not complete without the others. Awesome! 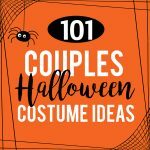 If you are still wanting some more ideas, be sure to check out these 87 couple costume ideas, or have fun with these 50 fun Halloween foods! 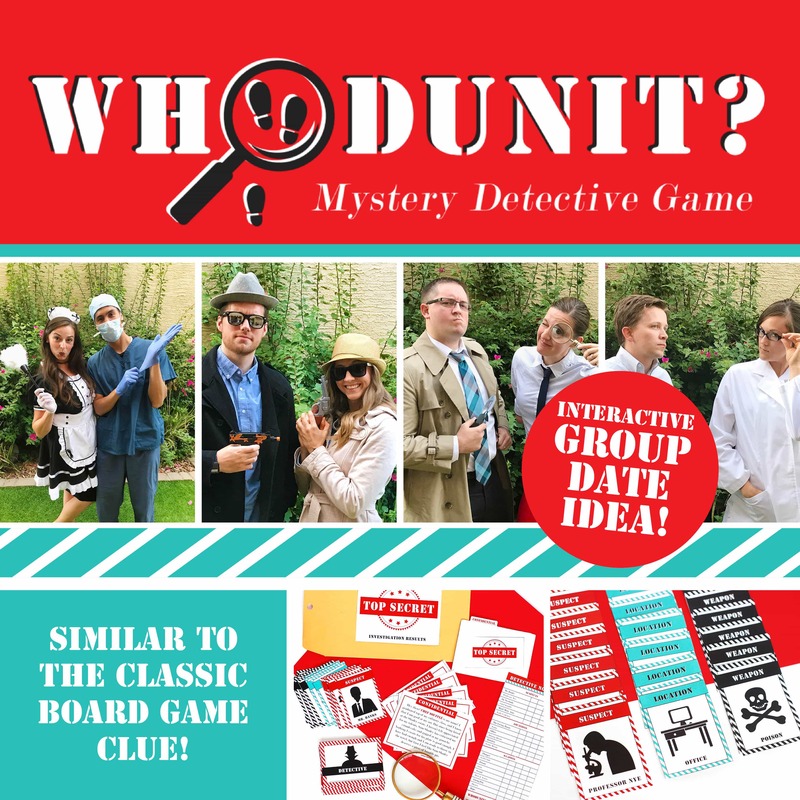 Our NEW Whodunit Mystery Detective Game! 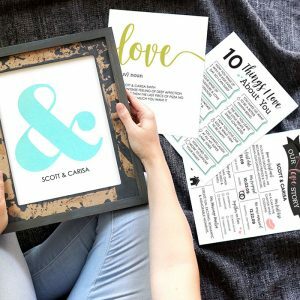 Invitations – includes both a paper and a digital version! 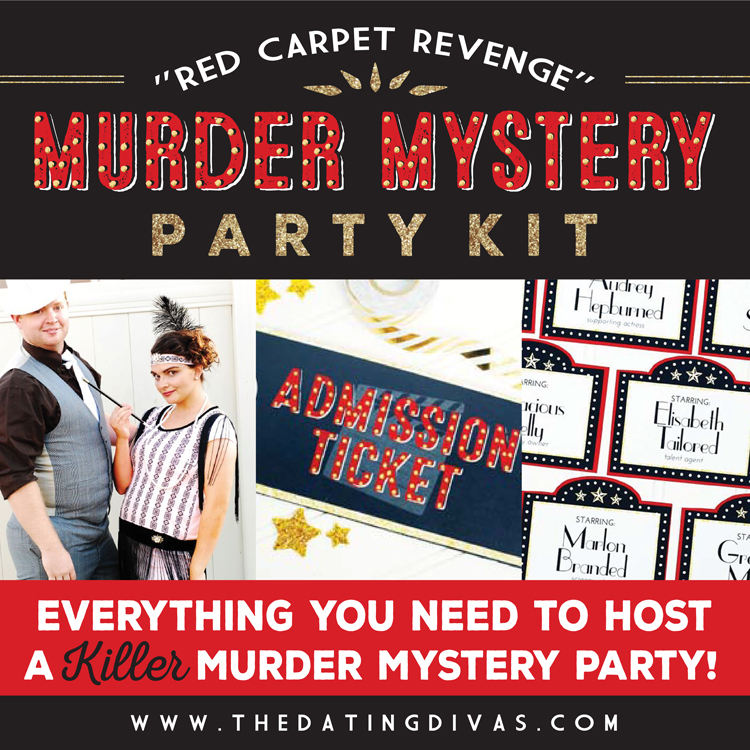 AND if you loved this, you HAVE to try our Murder Mystery Kit! 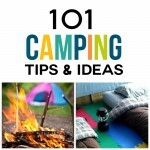 Hosting Ideas & Suggestions to make party planning a breeze. 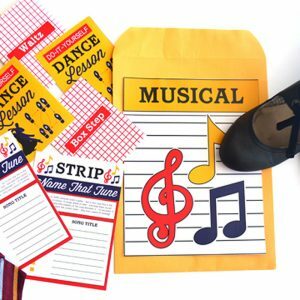 Invitations personalized for each character with costume ideas! Character Biographies to set the stage and story. Name Tags to identify each unique character. Table Cards & Food Tents to use if playing over dinner. Task Cards for the characters to complete in each round. Evidence Pieces to add intrigue and suspense! Voting Ballots and Awards to vote for your favorite characters & suspects. Great collection of costumes! Pinned! 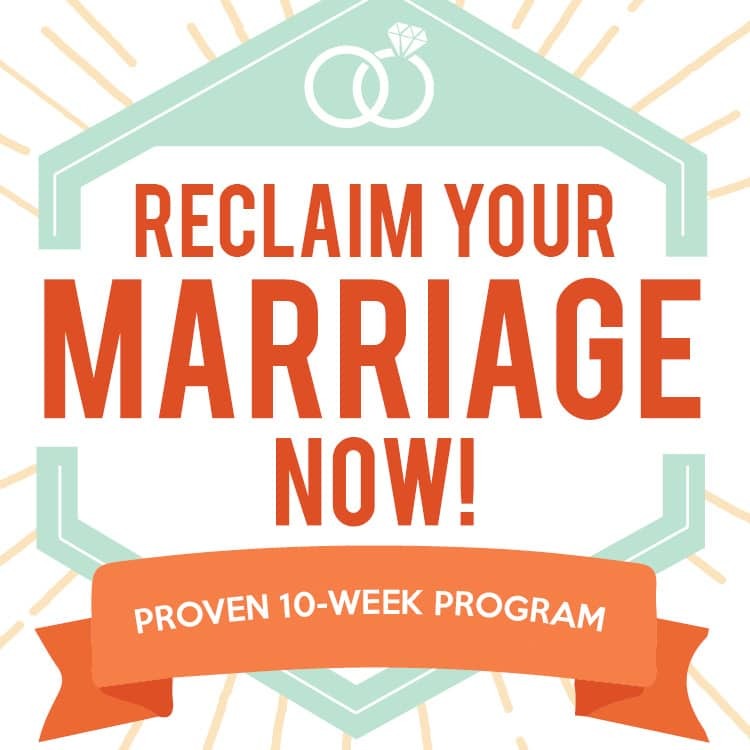 Glad you like this list Amy! Hope it helps for Halloween this year! I TOTALLY think I found my costume….. thanks to you, girly!!!! AHHHHH! So excited!!! Tara- anything for you chica! LOL! These are fantastic! I have been racking my brain for a costume for my little 1 year old and this has given me just the inspiration I needed! Thanks Cami! 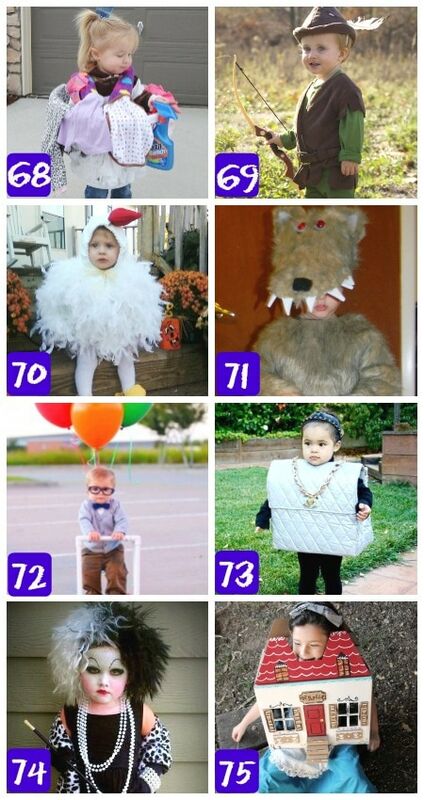 Courtney- You better be sending pics to me once you select what costume is for your little guy! Can’t wait! Jeeze… no more excuses for lame costumes, eh?! Love this, Cami!! Thanks Michelle! People really are so creative! Keelie- I hope you were able to find ‘the one’ before Halloween. Sorry this list didn’t do it for you. I am sure you had a great night! Thanks for your comment. I might have to use one of the maternity costumes! So many clever ideas! Gabby- I hope you found the perfect costume. Thanks for your comment! I like the pacman costumes for couple.. Thanks so much for sharing.